Email marketing has come back in full force, and brands that know their way around best practices can reap huge returns. According to a survey of marketers conducted last summer, the average ROI from email campaigns was over 100 percent! This ROI beat out other marketing channels by over four times, including social media, paid search, and direct mail. One study from 2015 even found that email marketing could generate as much as $38 for every $1 spent, which equals a mind-blowing 3,800% percent ROI. For anyone trying to squeeze more out of their email marketing or turn around their lackluster campaign success, here are 7 pointers for increasing the effectiveness of your email efforts. Talk to people about topics, products and ideas they are interested in. According to an infographic by Mailigen, using segmented, relevant messaging more than doubles your open rate while driving 18x more revenue for your campaigns. This approach makes a lot of sense if you have ever been to a party where someone is droning on and on about something you just don’t care to hear about or have any interest in. “Have you seen how expensive jogging strollers are these days?” they ask, not bothering to remember you don’t have kids and haven’t jogged since high school. 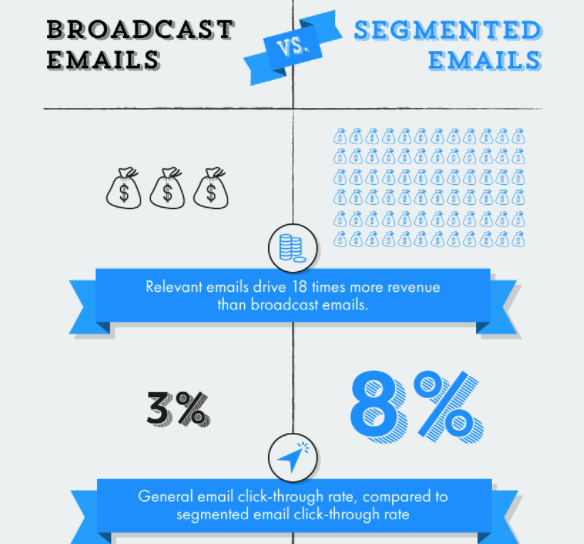 Not having email segments is the same thing. Ensure your list is segmented by buyer persona so that every message is as relevant as possible. For people who self-subscribe, you can even give them a chance to customize the content they receive by interest, product category and other choices from a pick-list. Just don’t count on them to do all the work of segmenting for you! Using an email automation system like Constant Contact or Mailchimp is critical to keeping these segments organized, but you can also potentially do-it-yourself by just separating your mailing lists into separate content buckets. Once you have segments established, take a moment to strategize the difference between each segment based on consumer traits, progress through sales pipeline and other situations. Then, outline the type of content that would be most relevant to each segment as well as what would be least relevant and should not be sent. Taking a moment to get to know your audience can dramatically increase your open rates while lowering the amount of frustrated subscribers. When we hear our names — even if we know it’s someone else with the same name being called — we tend to take notice. Chances are good that your parents were pros at this technique. When they said your name before a sentence, you knew they meant business! We have the same reaction when we see our names in an email. Personalization with a name and other details increases open rates by 26 percent, and it can even help drive brand affinity. Note that personalization involves more than just adding a first name to an email. The entire message should be framed as if the recipient is having a 1:1 conversation with the sender. 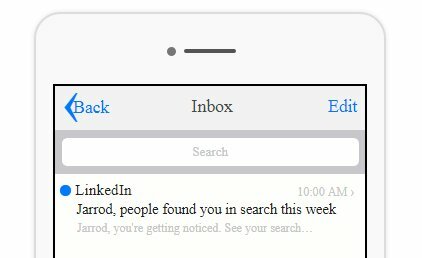 LinkedIn has become a pro at this tactic. They use personalization in a way that makes you sit up and listen. Looking at moi? Go on, I’m listening! The above message not only includes a name but signals that an exciting activity has happened. It says people are looking at your profile. Think of ways to mirror this effect so people get excited or intrigued just from looking at a subject line. Segmenting your user base by the products they have bought (or expressed interest in) is another way to connect more deeply right from the subject line. “New Jeep Anniversary Fog Lights” can be a way for a Jeep Wrangler owner to have immediate interest, for instance. Data shows that this type of personalization is table stakes for marketers with successful email programs. “88 percent of those that exceeded revenue expectations have personalization measurement systems in place,” says Inc.
A lot of marketers mess up promotional emails right from the moment they begin creating the subject line. 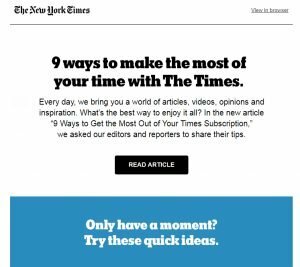 You should scrutinize your subject line, get in-house feedback from a fresh set of eyes, and A/B test different subject lines before rolling out massive campaigns. The first step is to make sure you are using some sort of subject line preview tool, like this one. Seeing your subject line visually helps you better-imagine how a recipient would react to it in their inbox. Take special note of how the email looks on mobile devices since over half of email opens come via mobile. People tend to filter out what emails to read by the subject line alone. 69 percent of email recipients will report a message as spam based solely on the subject line. Note that not every “common marketing knowledge” pointer like this list may work for you and your audience. Always test to be sure! Thinking like a recipient means coming up with ways to offer something they might actually want. For sales and promotional offers, think of the hottest product they might want or the best offer possible. Don’t just tell them there’s a “sale”; tell them what that means. 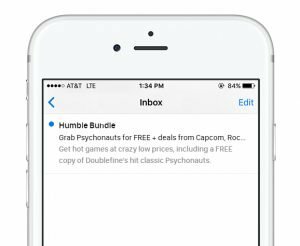 Humble Bundle, which offers discount video game bundles, leads with its most popular game in the package. When offering something non-material, like information, explain clearly how the contents of the email benefit the user. It could be something deep/important like “Want More 5 Star Reviews☆☆☆☆☆?” or even the promise that “You’ll Laugh Way Too Hard at These Marketing Puns”. Many email marketers find great results by telling their audience how they can get more out of the products or services they already use. The New York Times has gotten this down to an art. 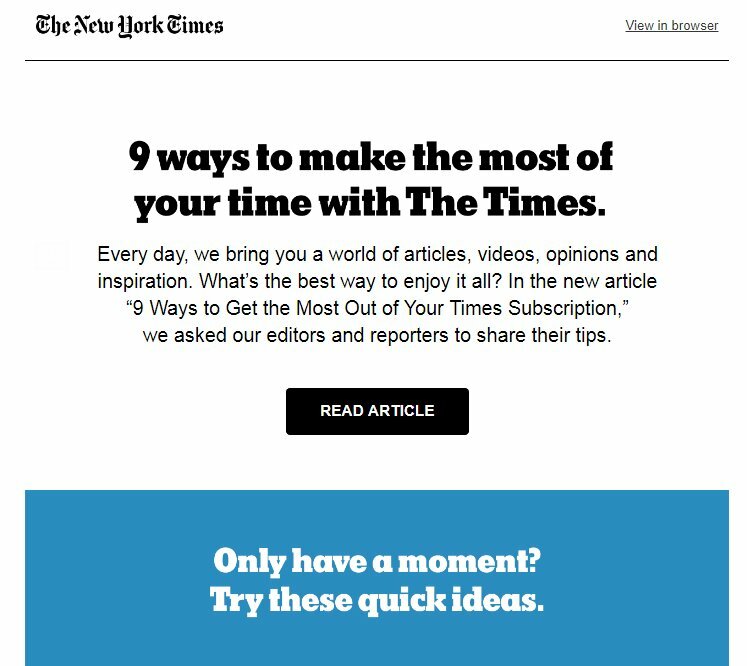 Since there is a million different pieces of content on their site other than what you see on the homepage, they take it upon themselves to inform subscribers about how they can learn and do more on NYTimes.com. 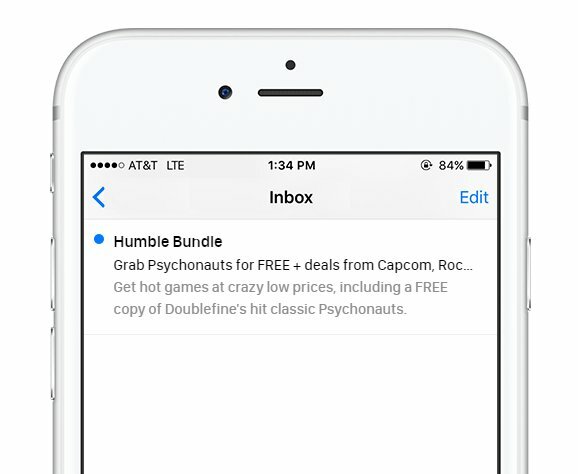 Get more from my subscription while spending less time? Sure, why not? HTML-based email templates have transformed inboxes from a boring wall of text to a gorgeous place for showcasing compact content or well-designed advertisements. Images are especially important for mobile since they make messages more colorful and intriguing as well as easier to read. Since 80 percent of email users are expected to access their inbox via mobile at least some of the time by 2018, thinking about their needs is vital. 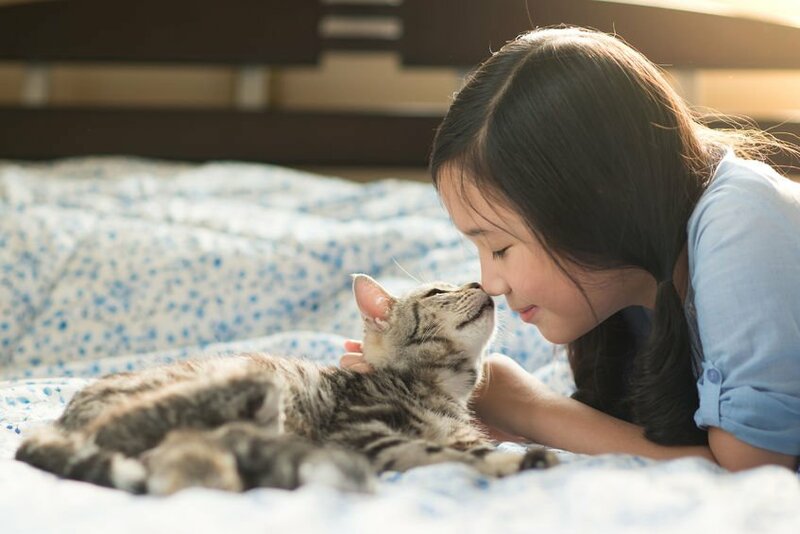 Using human-centered images like this stock photo can invoke emotion and draw the eye to certain email sections. Make sure you have text-only alternatives for image blockers, and try not to get too overboard with the images you use. Using images in a sloppy or unappealing way can sometimes hurt rather than help. Using video embedded within email or as a link can likewise help you improve open rates and click-throughs. According to one source, just using the word “video” in a subject line can boost clickthroughs by 65 percent and opens by 19 percent. This one is simple: every email should have a call to action (CTA). 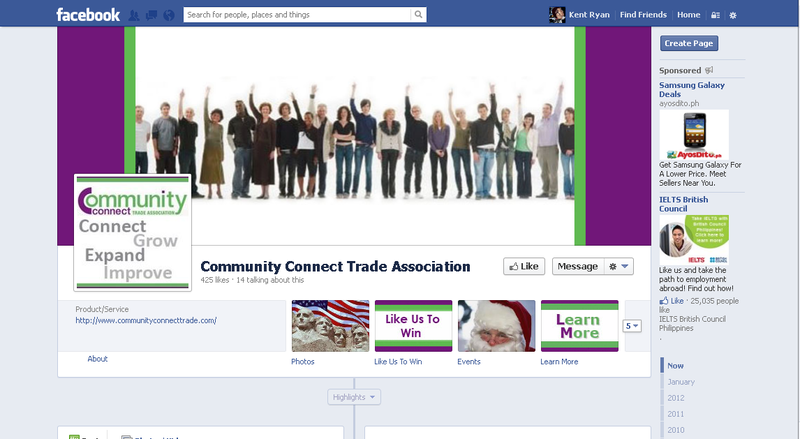 Ensure that your CTA is crystal clear and compelling. Every recipient should know exactly what you want them to do and how to do it. Providing a landing page after clicks to direct them more linearly to an offer can help simplify the process further. That way, your real CTA is just “Click Here,” and then you can drive more complex conversions from the landing page. Avoid conflicting CTAs or multiple messages. No matter what you say, your ultimate conclusion leads the audience down ONE possible path. This practice will help your clickthroughs thrive. Lots of email marketing strategies tend to work well across the board for a majority of industries, but there is no single set of hard-and-fast rules. Instead, every company has to study their own data in order to find what their audience seems to like/dislike about their emails. Learn how to learn more from your email analytics, and use the lessons to optimize your approach over time. Trial-and-error is the only way to truly get better at something, and luckily email gives you plenty of lessons in the form of data. Mastering email marketing takes a lot of experimentation, practice, trial-and-error and attention to detail, but by following the best practices mentioned above, you can be well on your way towards greater success. Pay attention to what your data tells you, and keep up with the latest email marketing trends and advice on our blog to learn best practices that make you an email genius over time!